The Atlas of Global Inequality explores aspects of inequality using online, downloadable maps and graphics. All materials can be reproduced without charge if they are attributed to the UC Atlas of Global Inequality. Global inequality has grown dramatically over the last 300 years. At the end of the Twentieth Century global income inequality was greater than ever before. There is debate amongst academics, between street protestors and global institutions, and elsewhere, about the whether inequality is rising or falling. This Atlas seeks to shed light on that debate and to broaden discussion to include aspects of inequality beyond income measures and beyond aggregated national statistics. The Atlas already includes sections on Health, Gender and Economic Crises. And it will be expanding in the future. - A database allows tables and graphs to be generated and downloaded for selected data and countries. - Texts and the Glossary provide explanation of the issues and terms; the Bibliography provides direct links to the research. - Teaching modules provide suggestions for using data and maps in classes. the UCSC campus provided a new forum for a wide range of academics, policy experts and professionals to further the debate over global inequality. A more detailed summary and links to papers and presentations can be found here. 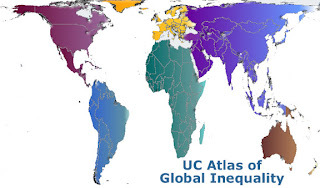 4/13 - Information about the UC Atlas Global Inequality Conference is now avaliable. 2/5 - Added CEISIN's Global Distribution of Poverty to the online datasets. Our Online Datasets page is a list of many websites containing information on Global inequality. It can be sorted according to several criteria, including year, level of geographic coverage and degree of interactivity. 12/1 - Interactive maps of development indicators are now available. Make a map of the world based on your own choices of indicators and years. The Mapping Global Inequalities: Beyond Income Inequality conference held this last December on the UC Santa Cruz campus provided a new forum for a wide range of academics, policy experts and professionals to further the debate over global inequality . A link to the MGI Book of Abstracts (in PDF format) can be found here. This report advocates taking equity into account when determining development priorities and supports public action that aims to expand the opportunities of those who are less capable and where policy interventions are absent. The paper studies the relationship between globalization and inequality, and suggests that the income of the poorest 20% (bottom quintile) should be the focus for policy-makers. He calls for a new international organization to reduce global inequality. Worldmapper is website containing a collection of world maps, where territories are re-sized on each map according to the subject of interest. The maps presented on this website are equal area cartograms, which re-size each territory according to the variable being mapped. The project is a collaboration between faculty at the University of Sheffield and the University of Michigan. The objective of this paper is to use region-specific poverty lines instead of country-specific to examine the effects of poverty levels on country geographic and demographic poverty profiles. The authors are highly critical of country-specific poverty lines and suggest that regions specific lines provide a more complete understanding of a nation's poverty. This article reviews what is known about how globalization may affect poverty and inequality. The literature review is organized according to the different causal links, or "channels," through which global integration may affect inequality and poverty. Appropriately, it is the opening article in a World Development Special Issue on globalization and the world's poor. Kapur and McHale explore available policy responses to improve today's international migration system, where skilled labor migration from poor countries to rich countries is rapidly increasing. Pranab Bardhan explores the effects of globalization on both agricultural and non-agricultural rural sectors around the world. At the 2006 WIDER annual lecture, Angus Deaton pointed out that global inequalities in wellbeing are wider than global inequalities in income. The poor of the world are not only poorer than the rich, but also face more diseases and lower life expectancy. Book on global inequalities with significant theoretical insights. Case studies on global health, exclusion, mobility, part-time work, knowledge, and on four country case studies: Brazil, China, Russia and France. This report builds upon existing research on the world distribution of household wealth to show the large income gaps and inequalities between the global rich and the working poor. In this article John E. Roemer reviews the 2006 World Development Report (WDR), issued by the World Bank. Instead of using GDP per capita as a measure of development, the 2006 WDR introduces a welfare concept based on recent ideas from political philosophy and welfare economics. Redefining Progress is a non-profit tracking the global economy, environment, and social justice with tools like the Genuine Progress Indicator and Ecological Footprint.